Yep, you can grow large bunches of grapes outdoors in Forest Hill - and eat them! 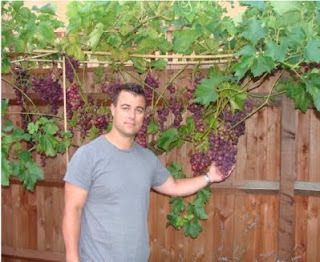 Tony Petim, a Forest Hill Society member, shows just some of his many bunches of grapes - many measuring over 25cm in length - from his small garden in SE23. Tony was brought up growing grapes and making wine with his parents in Portugal but today he just enjoys them for garden decoration and eating. The tradition where he comes from is that you share excess harvests with friends, family and neighbours, which is how we found out about them. They are delicious! So we asked Tony to share his secret. Position – Pick a reasonably sunny position, although not essential. Large pots are OK but a well drained hole in the garden soil is best. Purchase - Get a grape vine from a local garden centre. Plant it and leave it alone. Variety is not important as most of the ones sold here will handle the average English weather. Pruning – In late February or March the following year, prune back to the main stem, leaving one stem or the main two “brown” stems (if any). Training – As new green buds grow, keep only 10-20 green bud shoots, depending on the size and age of your vine. Pick off the ones that grow low along the main stem. These sap the strength from the green shoots above. When you have your 10-20 buds, be merciless with any new ones and nip them off! The 10-20 buds will grow and grow. Fertilizer – When buds start to appear in late February or March, feed the vine with a high potash fertiliser every 2 or 3 weeks. If growth is poor, then give it a boast with some nitrogen based fertiliser. Nipping – OK, this is the real secret. i) when the grapes start to grow, nip 1 or 2 leaves nearest the grapes. ii) as the vine grows, say, another 50-100cm from the grapes, nip the ends of that vine to stem its growth. This means more of the plant’s energy goes into growing grapes. Pests – Use standard pest control sprays to treat problems such as vine weevil, downy mildew, grey mould, etc. Eating – Wait, wait,...wait...and then, in early to mid-Sept, pick the grapes off and enjoy them with friends, family and neighbours.